The Science Museum is one of the three large museums on Exhibition Road, London. It is part of the National Museum of Science and Industry. The museum is a big tourist attraction in London. The science museum is a great place. ↑ 3.0 3.1 "About Us - History". Science Museum. 1919-05-09. Retrieved 2010-07-07. ↑ Encyclopædia Britannica. 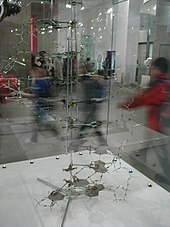 "Science Museum (museum, London, United Kingdom) - Britannica Online Encyclopedia". Britannica.com. Retrieved 2010-07-07. ↑ "Library and Archives - About us". Science Museum. 2010-02-03. Retrieved 2010-07-07. ↑ "Blythe House - About us - Science Museum London". Retrieved 21 September 2011. This page was last changed on 26 November 2018, at 10:36.